Just last week, Sikorsky, one of the most renowned rotorcraft industry companies, was purchased by Lockheed for $9 billion. Previously, Sikorsky had startled the helicopter market by laying off almost 1400 workers due to a significant decline in oil & gas explorations around the globe. Back then, 80 per cent of all company sales came from offshore business and 90 per cent of all hours flown by the company’s commercial aircraft were the hours spent on offshore operations. Couple such focus on a single market with the historically low fuel prices and we’ve got a very sticky situation to solve for all – OEMs, owners and operators. According to the aerospace research firm Teal Group, the O&G industry now accounts for as much as 40% of the roughly $6 billion worth of annual sales of helicopters for civil use, making it the largest non-military segment. Moreover, since 2006 the sales of rotorcraft in this segment have doubled. However, since the midst of 2014, crude oil prices have dropped significantly due to political and economic reasons, making offshore exploration way less attractive to most companies. As a result, OEMs and aircraft owners have been forced to seek other possible uses for their operated and owned machines. For instance, the current situation in the market is way less disturbing for those who own such multipurpose aircraft as ЕС-145, Mi-8 or Mi-17. The Russian-built legends are used in almost every imaginable mission from firefighting and timber logging to transportation. Moreover, they can be converted for private, emergency or even military use at a lower price due to a large amount of spare parts available. Their technical maintenance is considerably cheaper too. In addition, the aforementioned medium twin-engine machines alongside their competitors from Bell, Airbus Helicopters and other OEMs will probably lose only a fraction of the offshore orders. According to HIS Energy, only between 20 to 30 percent of the demand for off-shore helicopters are tied to exploration. The remainder is generated by the need to transport workers, various goods and equipment to the already-producing facilities. What it truly means is that converting machines to transportation rather than exploration will relieve at least some pressure for both, owners and producers. “Even though in 2008 the world thought that the price of oil could reach $200 bbl., the prediction was clearly false. Despite the fact that situation in the industry is still rather tense, owners can now turn to MROs for the much needed helping hand. 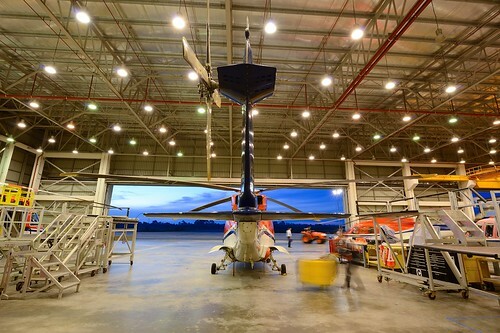 Third party maintenance providers with the strong knowledge in such versatile machines as Mi helicopters can carry out the much needed conversion for a very reasonable price. And as the world keeps changing the way it explores and retrieves fuel and natural resources, rotorcraft industry must work in close cooperation to be able to keep up and adapt to the changing demand,” concludes Anatolij Legenzov, the CEO of Helisota.